Photos are printed onto canvas using our 8 colour HP Z5200 inkjet printer onto high quality canvas and stretched over deep timber frames. The genuine HP Vivera inks are fade resistant to 200 years providing lasting colour protection for our canvases. We have various size frames which can be combined to produce various shapes and sizes. We have produced canvases with pictures of pets, children even new houses for Architects to hang in their offices. They make ideal presents and come complete with hanging kits. The most popular size of 16″ x 24″ which is just £30 plus VAT. 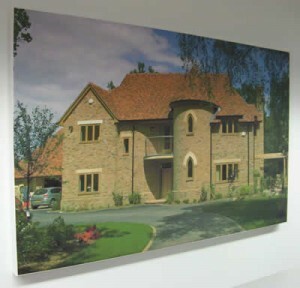 We can also supply just the printed canvas (without the timber frame), please contact us for prices and further details. Canvases are supplied stretched with wedges fitted, these can be stretched further by driving the wedges in further if the canvas becomes loose.